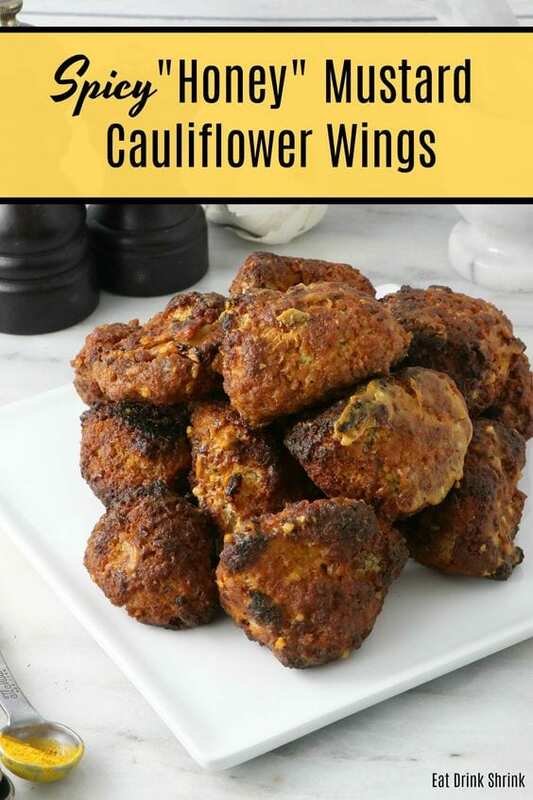 Vegan Spicy Honey Mustard Cauliflower Wings - Eat. Drink. Shrink. 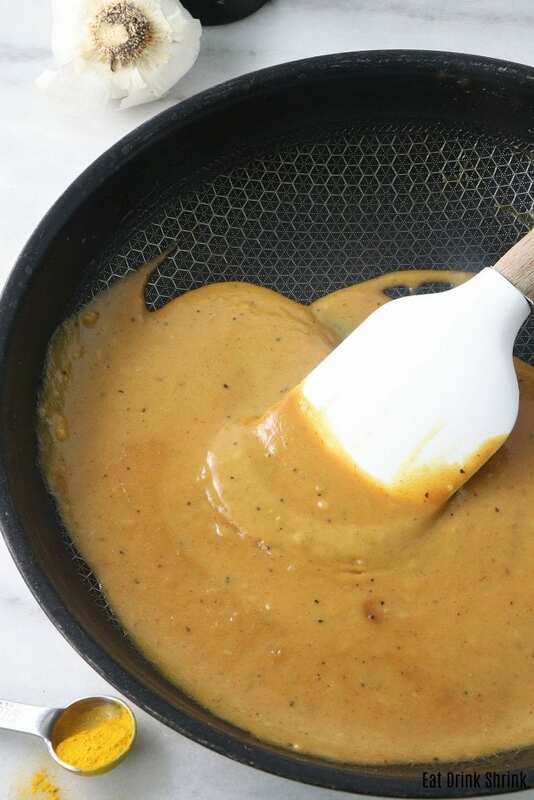 While dijon is a staple in sauces and dressings, honey mustard just isn’t a thing unless you’re creating some indulgent eats! 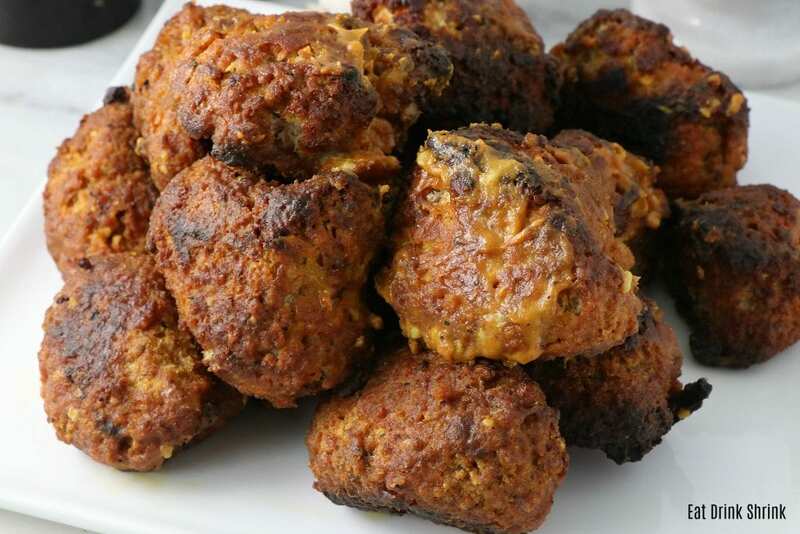 One of the most viewed recipes on EDS is my classic Buffalo Cauliflower Wings. 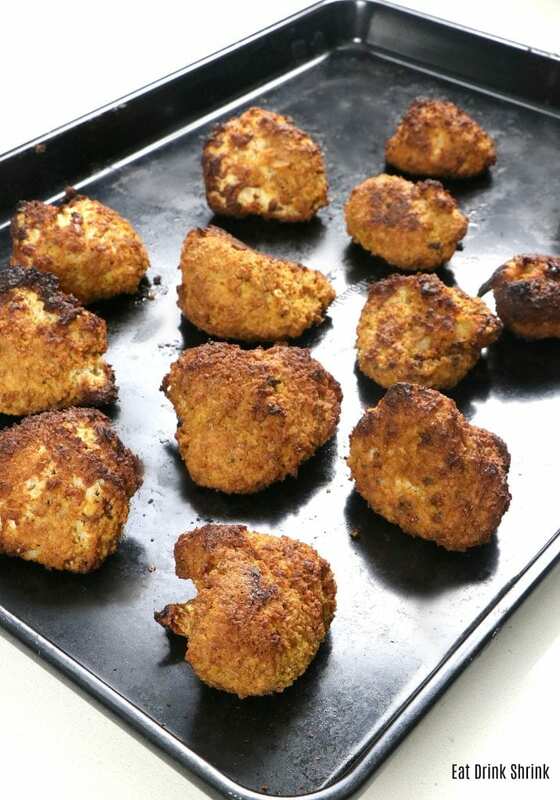 I’m not sure why my recipe captivated people, but the texture is crispy and not soggy, mitigating clean up and allowing them to hold up while being left out while entertaining. 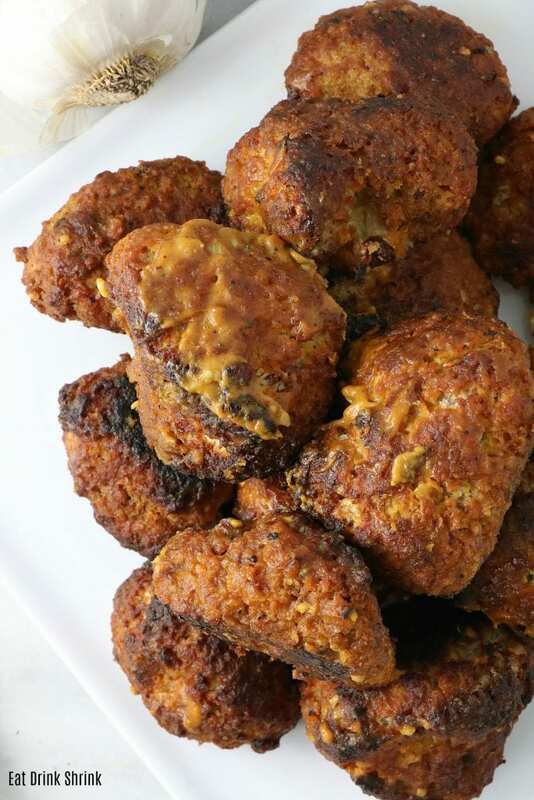 It’s one of my favorite recipes, and I love all things heat, but there are so many flavors you can create with cauliflower wings. Years ago I explored Asian Cauliflower Wings and this year I finally gave in to the flavor on my bucket list..
What I love about this recipe, is everything! 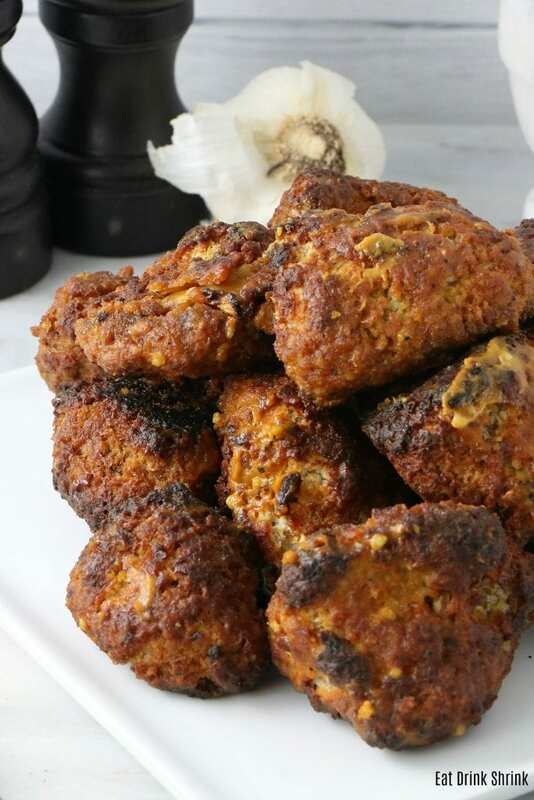 It’s that classic crispy texture, the sauce is sweet, spicy, flavorful, easy, affordable, the sauce can be used for countless other concepts, non vegan approved, perfect for entertaining, and I’d have to say.. my new favorite recipe! If you love all things honey mustard, love perf cauli wings, then you’ll love my new recipe for vegan Spicy Honey Mustard Cauliflower Wings! Sauce can be used for other dishes! Preheat oven to 450 degrees. Break the cauliflower into florets. For the batter combine the flour, garlic, salt/pepper, and almond milk in a bowl. Batter should be on the thicker sider. Set out another bowl and fill with Panko. Dip the cauliflower into the batter, letting the excess drip off, then dip into the Panko coating them all over. Place onto a baking sheet and bake for 15-20 minutes until golden brown. While they bake, make the sauce. Heat a saucepan over medium heat. Melt the vegan butter, and then stir in the garlic. Cook for 1 to 2 minutes, or until the garlic is lightly browned. Add the remaining ingredients, bring to a boil, whisk and combine, reduce to a simmer for about 3 to 5 minutes or until thickened. Set aside. Dip the cooled cauliflower wings into the sauce, coating all over, then pop back in the oven for another 10-15 minutes until crispy again. Once cooled, I coated mine in additional sauce just to give them an extra flavor boost and some added shine! (if you're crammed for time, you could just bake once and coat!). Serve with vegan honey mustard dressing! Hi Christina! I love to hear that! I was actually going to get new images of this recipe this week, because it's SO GOOD! !